Able Aerospace Services is one of the industry’s leading providers of FAA-approved MRO and completion services for more than 1,400 fixed- and rotor, civilian and military customers in more than 60 countries across the globe. 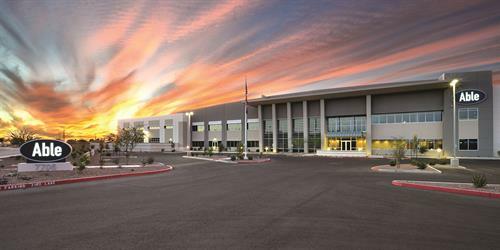 Our 200,000-square-foot, state-of-the-art, fly-in facility takes the promise of “under one roof” to new heights, bringing a team of more than 400 expert mechanics, talented engineers and customer support teams together in one location. This purpose-built environment allows us to complete more than 95 percent of all jobs on site in a captive, fully controlled process where we can ensure quality and deliver quick, cost-effective solutions. Among these solutions are more than 8,000 proprietary rotor-wing and fixed-wing repairs, one of the industry’s largest component exchange pools, and ruck- and fly-in convenience for complete avionics upgrades, fleet maintenance management and paint services. Able serves multiple Original Equipment Manufacturers (OEMs) - from Leonardo. Airbus and Sikorsky to Boeing and Bell - with airworthiness certifications from entities located across the globe. Decades after opening our doors, we continue to extend our capabilities and grow our team. While many things have changed over the years, one thing has remained the same: Able’s unrelenting focus on being the best and safest value alternative around for aircraft parts and maintenance. More than 8,000 proprietary and FAA-approved rotor-wing and fixed-wing repairs. More than 400 highly trained mechanics, engineers, sales and customer service experts. Global footprint serving more than 1,400 customers in more than 60 countries worldwide. Decades of experience with an eye toward continued growth and excellence.